Quite simply, without the incredible expertise assembled at Nemours, KidsHealth would not be possible. From reviewing content that helps nearly 250 million online visitors each year to being featured in a KidsHealth video seen in children’s hospitals throughout the United States, Nemours Associates play a vital role in everything KidsHealth does. 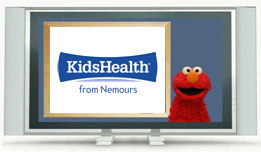 KidsHealth provides world-renowned education and prevention media and is an important part of Nemours’ unique integrated health system. No other children’s health system has anything like KidsHealth and the Nemours Center for Children’s Health Media. The Center gives Nemours a national and international voice through KidsHealth.org, the world’s number one most-visited website devoted to children’s health. Additionally, tens of thousands of teachers, school nurses, and coaches visit KidsHealth in the Classroom, our site for educators that offers free health lesson plans and activities aligned to national standards. KidsHealth helps build Nemours’ prestige within the health community. More than 55 children’s hospitals, the U.S. Department of Health & Human Services, and the American Academy of Family Physicians come to Nemours’ KidsHealth for their online and off-line health education information for families. The National Library of Medicine links to thousands of Nemours’ KidsHealth articles in English and Spanish from its highly regarded MedlinePlus.org. All kinds of organizations seek KidsHealth’s expertise on creating engaging health messaging for their audiences. We’ve worked with Cheerios, Sesame Workshop, PBS KIDS Sprout, and the NBA, just to mention a few. Media seeking balanced, accurate health information turn to Nemours’ KidsHealth. From ongoing media partnerships with MSN and Seventeen magazine, to interviews on national television programs like the TODAY Show, KidsHealth is recognized by the media as an expert resource. 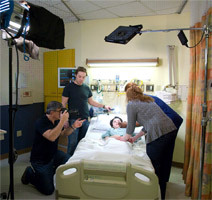 KidsHealth generates millions of dollars of positive publicity for Nemours each year. To become involved with KidsHealth, contact Sean Sexton, Content Integration Manager, KidsHealth. To suggest other ways KidsHealth media could be useful to your practice, contact Kate Cronan, MD, Director of Clinical Integration, KidsHealth.